Affectionately known as the Log Mansion, this spacious retreat offers contemporary up-to date living. An abundance of light and open sight-lines from the well equipped kitchen straight through to the living room are complemented by warm and rustic country character, so elegantly displayed in the interior log posts, wood accents and stone fireplace. Entertainment spaces galore both inside and out for all season enjoyment. The back yard is a true spa-like haven, private with 360 degree decked in pool and hot tub, only steps away from your screened-in porch and living room. Decks on three sides (in addition to the huge front porch) for morning coffee, memorable cocktail parties and barbecues, evening conversation at the fire pit, lazy summer sunning and Fall leaf peeping - all from within your own private domain. The unique Western mountain views from the wraparound front porch are breathtaking, particularly each day at sunset. A first floor Master suite with dual walk-in closets and outdoor deck provide a quiet oasis from the many guest options both upstairs in the two sizable bedrooms and den, as well as the finished walk out basement where you will find a large family room and gym. Great for additional guest overflow, home theatre, yoga studio, you name it. The kitchen is suitable for any pro chef or foodie, with an abundance of cabinetry and pantry space coupled with gorgeous gray/green granite and maple butcher block counters. 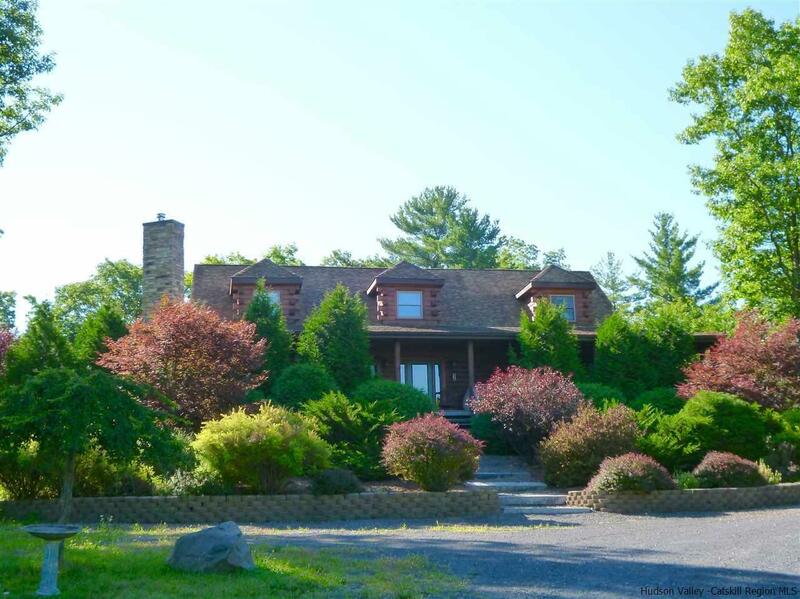 Comfort, modern amenities, and lots of breathing room all on a 5 acre parcel complete with your very own pond for watching wildlife and hearing the “peepers” at dusk in Springtime. An all around winner for weekend, full time or investment (vacation rental) possibilities. Located within 10 minutes of the Thruway and 15 minutes to Woodstock or Saugerties, there are wonderful swimming holes right up the road, as well as trail heads for hiking, excellent restaurants, farmers markets, shopping, and cultural events in each Village as well as the surrounding towns and uber hip Kingston! Close to skiing and the Hudson River.